Have you Heard About the FixMeStick? I'd like to tell you about a new product that I recently had an opportunity to try. Known as the "FixMeStick", it's an antivirus and anti-malware tool that comes preinstalled on a USB flash drive. Unlike some other antivirus solutions, you don't install the FixMeStick's software into Windows... instead, it runs directly from the flash drive. I really am impressed by how well it works, and while it's not a replacement for your regular antivirus it does have the potential to find and remove viruses, Trojans and malware that your current software might have trouble with. Here's a quick rundown of how it works. You plug the FixMeStick into your computer and reboot (it even has a "Run FixMeStick" program that reboots the computer for you if you like.) When your computer boots up, it boots from the FixMeStick instead of booting into your regular OS (though depending on how your computer's set up you may need to select it from the boot menu.) With Windows not running, the viruses can't run. The scanning software scans your entire hard drive, eliminating any viruses or malware that it finds... even pieces that would be normally be able to hide in Windows. Once the scan is done and the threats have been quarantined/removed you can reboot your computer and remove the FixMeStick to let your operating system boot normally. That's one thing that the FixMeStick does really well... it keeps the process very simple. The technology behind it is pretty powerful (I'll get to that in a moment), but you don't have to know anything about it to get it to work. All you have to know how to do is plug it in and reboot; the simple scanning interface is easy to understand and it gets the job done without the need for advanced technical knowledge. The FixMeStick is a simple-to-use, self-updating, self-contained USB hardware gadget. You just plug it into your PC's USB port, reboot, and let it run. Once it's done, you simply pull it out and reboot your PC, and your PC returns to your regular Windows operating system. About that power I mentioned... when the FixMeStick boots, it launches a custom version of Linux that runs the scanning software that finds and removes your viruses and malware. Three separate scanners are used: Kaspersky Labs antivirus, Sophos antivirus, and GFI's VIPRE antivirus. Both the Linux base and the separate scanners are all hidden behind the scenes, though; the only thing that you deal with when the scanner boots up is the FixMeStick user interface. It manages to keep things very simple while using some very powerful tools to remove threats that might otherwise be able to hide and keep messing up your computer or stealing your private information. Based on what I've seen, I really like the simplicity and convenience of the FixMeStick. There are a few points that I wish could be integrated into it, but by and large it really is an excellent product. Here's a breakdown of the things I like about it, as well as additional information that might be helpful if you're considering picking one up. • Simplicity. I've already mentioned this, but it's worth pointing out again... it doesn't get much easier to use a product than the FixMeStick. Plug it in, reboot, and just follow the screen that appears. Regardless of your age or level of computer experience, you should have little to no trouble using the product. You can even launch it from within Windows and it will reboot the computer for you and automatically start its antivirus platform. • Power. Three well-known scanners operate side-by-side to remove infections while the Linux platform makes sure that Windows-based infections don't have a chance to initialize and protect themselves. It can even take care of some of malware that seems to come back time and again because it scans your computer from outside of your normal OS environment. • Compatibility. I haven't tested it on a wide range of PCs, but from what I understand the FixMeStick works with just about everything. Even computers that have their BIOS set up to not boot from external devices don't seem to have a problem loading up the FixMeStick. • Review options. Though much of the process is automated, you still have an option to review the detected files before the FixMeStick software deletes or quarantines it. This helps to ensure that you don't accidentally lose programs to false positives, and also gives you more control over exactly what happens to those items that it detects. While this may not be something everyone will use, I know that there are some people who get really upset when their antivirus starts deleting things without giving them a chance to double-check what's being deleted. • Boot record management. If the master boot record of your computer is damaged or altered by malware it could prevent the FixMeStick from working. Again, this isn't the fault of the FixMeStick but a set of tools to repair a damaged MBR would be very useful and could keep this from being an issue at all. • Usage limitations. The FixMeStick can only be used on three computers, something that might be a bit of an inconvenience for people who have multiple laptops and desktops within the same household; a family of four could easily have four or more computers, and may have up to eight or more. While I understand the limitation and the count resets at the beginning of each month (so it's not tied to the same three computers forever) it could still be a point of interest for some who may want to consider the unlimited "Pro" version, but it costs significantly more. • Cost. The FixMeStick costs $59.99 for the standard version, or $299.99 for the Pro version with unlimited PCs. Both of these options come with one year of service, after which the FixMeStick can be "recharged" at the same rate per year. • System requirements. The FixMeStick requires a PC with a USB port running any version of Windows and that has at least 512MB of RAM installed. There are no other requirements. • Warranty. The FixMeStick comes with a one-year manufacturer's warranty. If it stops working within the first year, let the company know and they'll fix or replace the unit. 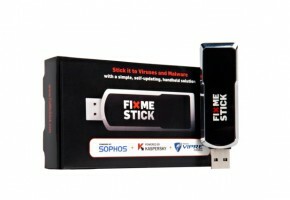 In the end, the FixMeStick is a solid product that provides powerful virus detection options in an easy-to-use format. It has relatively few drawbacks, and for the most part those drawbacks aren't so much problems with the device itself as they are a lack of additional features that might be useful. If you choose to get a FixMeStick, keep in mind that it's not intended to be a complete antivirus and antimalware solution; you'll still need to have a free or paid antivirus installed and should have a dedicated anti-malware program installed as well. The FixMeStick isn't a preventative solution, but instead is a safe go-to solution to fix your computer when an infection does happen. You can find out more about the FixMeStick or order your own by going to FixMeStick (which includes additional reviews, videos of the FixMeStick software in action and other useful information.) It's also available from Amazon and similar online retailers, where it holds a very impressive five-start rating. This page contains a single entry by Denise Richardson published on December 17, 2012 10:55 AM. How do I Request My Free Credit Report? was the previous entry in this blog. Signs of Telemarketing Fraud -- How to Handle Phone Scams is the next entry in this blog.